Cabinet made with 15mm thick plywood, reflex vent at back ensures better bass effect, beautiful cabinet and mesh grille design, high clarity sound, high power, rotatable and strong horn with dispersion(HxV) 90°x 40° , connectors 2pcs NL4MP, and M10 flying points for fixed installation, pole mount at cabinet bottom. Crossover board is fixed with AUDYN capacitors to reproduce clean HF sound. Different finish(Clear coating, Black, Purple, Gray, White, Brown) available for options. 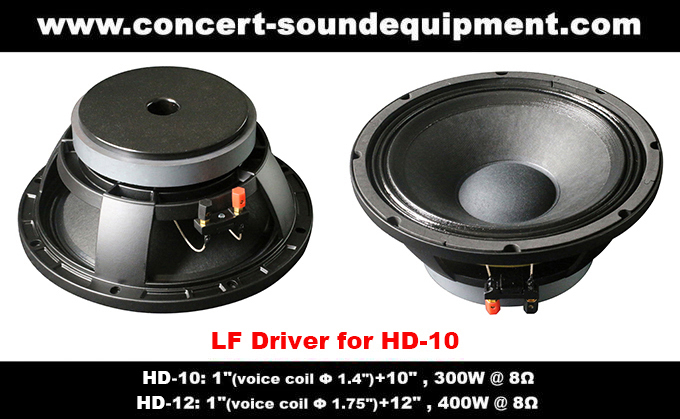 HD-12 full range speaker's HF driver has a 1.75" voice coil. The rotatable horn is harder and stronger than engineering plastic, not easy to get broken, and it can reproduce a better sound. The pole mount at the cabinet bottom makes stand and pole support possible. M10 flying points are for fixed installation. Clear lacquer and wood grain make the cabinet fresh and environmentally-friendly looking, suitable for some venues furnished with wood or other building material of warm colour. 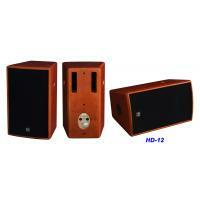 If you want smaller one, we have 10" HD-10. Packing: normal packing carton or flight case(2 pcs HD-12 vertically packed in 1 flight case). Components: 1"(voice coil Φ 1.4")+10" 1"(voice coil Φ 1.75")+12"